Barcelona line-up: Valdés, Adriano, Piqué, Bartra, Montoya, Song, Xavi, Iniesta, Alexis Sanchez, Lionel Messi, Pedro. Barcelona is back to the top of the Spanish League, after beating Sevilla in their own ground by 1-4 and catching up on points with Real Madrid and Atletico Madrid. The Merengues won their league fixture against Villarreal this past Saturday, while Atletico Madrid dropped the 3 points against Almeria, losing all the margin they had in the standings against both Real Madrid and Barcelona. The answer came through a quite controversial manner. A few minutes after we had crossed the first half of an hour in the Sanchez Pizjuan, Messi got dispossessed of the ball after what appears to have been a clean sliding tackle. Nevertheless, the referee had a different reading and awarded Barça with a free-kick from which the visitors would reach the equalizer right after. 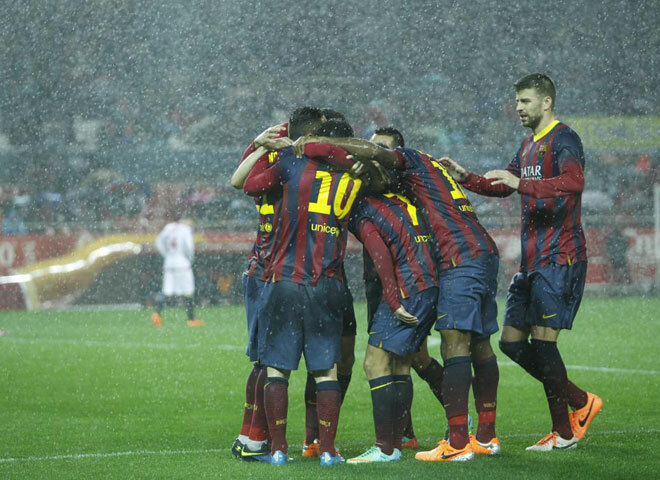 Messi curled the ball into the box and Alexis Sánchez headed it backwards to go past Beto and set the score in 1-1. The goal had even more controversy around it because Alexis Sánchez was clearly offside and the linesman didn’t call for it. Sevilla had been the most threatening side on the pitch until that moment, but Barça was slowly starting to take control of the game. In the 44th minute, it was time for Messi to also add his name to the score sheet and he has done it in a brilliant way. Adriano turned on another gear to spring a counter-attack, left it to Pedro on the left and the Asturian returned the ball to Messi on his right. The Argentina superstar needed one touch to prepare his shot and hammered it into the back of the net to put Barça on the lead. The 1-3 came in only in the second half, in the 56th minute. 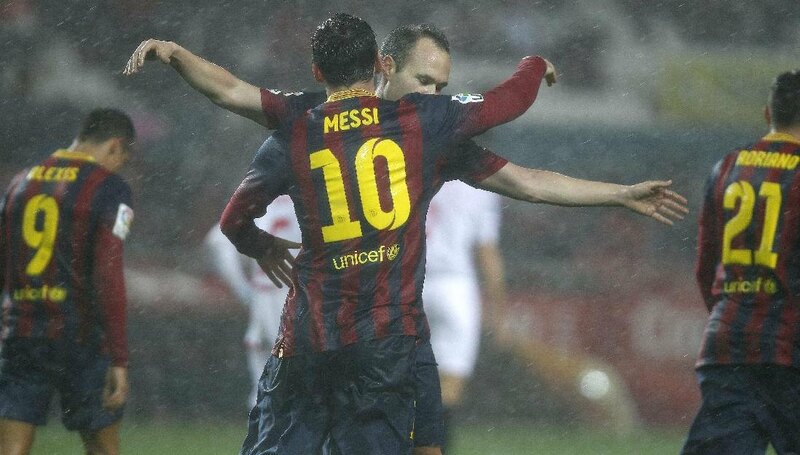 Once again, it was Lionel Messi who made all the difference, this time after being assisted by Andrés Iniesta. The 26-year old forward picked up a pass from his teammate and almost instantaneously struck the ball with his left foot, making it curl inside the Beto‘s right post. 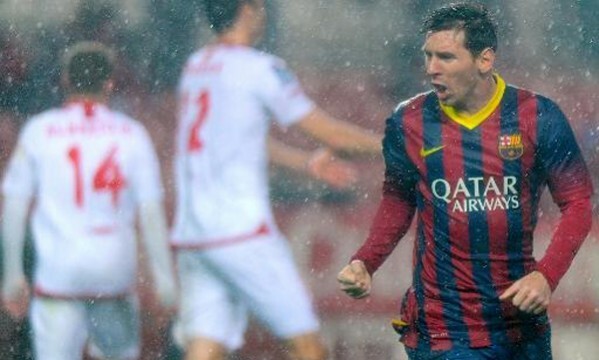 Two goals and one assist for Messi, who didn’t have a perform of this level since he got injured last year… The deal was sealed close to the final whistle of the game, after a counter-attack led by Alexis Sánchez on the right, who assisted Cesc Fabregas in the centre for a world-class finish. 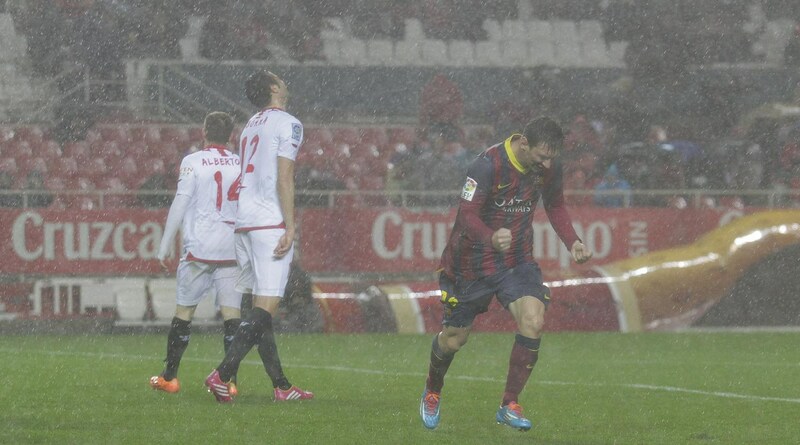 The former Arsenal midfielder chipped the ball above Sevilla‘s goalkeeper and set the final score in 4-1.